There are so many great gardens with public access in the DC area. With spring finally here it’s time to venture outside and visit one of these lovely spots for a picnic or tour. 1. Dumbarton Oaks: Nestled in Georgetown, Dumbarton Oaks is a 1920s garden with many distinct areas to tour like the informal Lover’s Lane Pool and more famous Pebble Garden designed by landscape architect Ruth Havey. Garden tickets $10. Museum free. 2. Hillwood Gardens: Just off the bike paths of Rock Creek Park and only a 15 minute walk from the Van Ness metro, the Hillwood Gardens is a transit friendly escape. Tour Marjorie Post’s house and grab lunch at the cafe or bring a picnic and sit at one of the many tables overlooking the Japanese garden. Suggested donation $18 for house and garden, includes tour. 3. Kenilworth Park and Aquatic Gardens: On the river and across from the Arboretum these aquatic gardens have a different look with lily pads and bridges. Snack alongside colorful dragonflies which are the garden’s natural mosquito control. Entrance is free. 4. Brookside Gardens: A little further away in Maryland, just off of the Northwest Branch Trail are the Brookside Gardens. One of the bigger gardens, there is lots of variety here with hiking and walking paths. During colder days their conservatory houses seasonal exhibits. Entrance is free. Yes, you will work up a sweat. Many organized volunteer activities leave participants bored without feeling like they’ve helped out. Not with DCBIA, they had enough work to keep 100+ people busy for 5 hours building a park + community garden. Spending time ‘in the field’. It’s rare to get to build something without a mouse click. You can get involved before the big build. Volunteer architects, planners, engineers, and other designers start working on the plans months before the build day. See how you can get involved. See more about the volunteer day here. 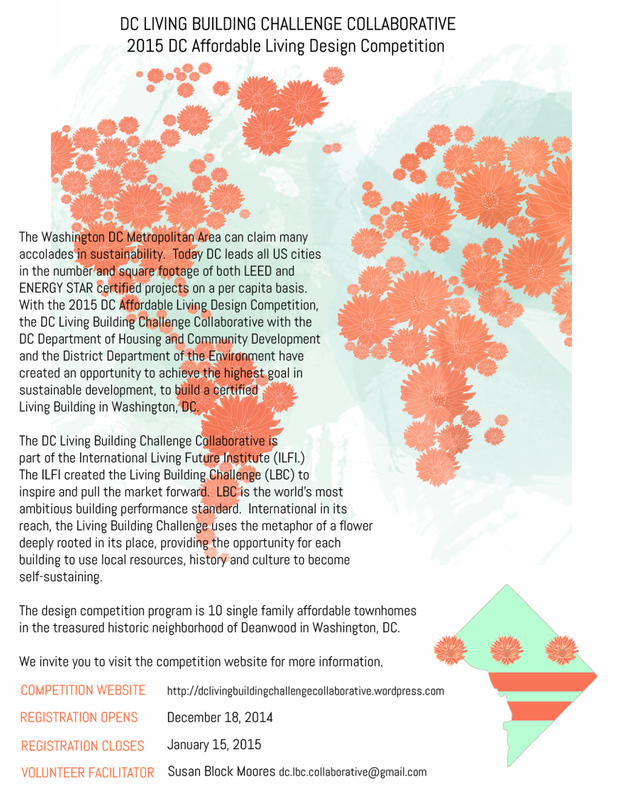 The DC Living Building Challenge Collaborative has been working with the District Department of the Environment (DDOE) and the DC Department of Housing and Community Development (DHCD) to propose this competition. The competition is to design 10-15 Living Building Challenge residences in the Deanwood neighborhood of Washington DC. See more and register your team at DCLBCC.